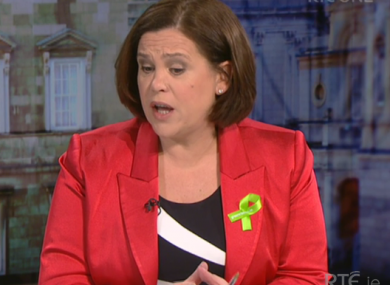 Sinn Féin's deputy leader Mary Lou McDonald. SINN FÉIN’S DEPUTY leader Mary Lou McDonald TD has said that she thinks the Sisters of Charity should “gift” the controversial maternity hospital site to the State. The site is on Merrion Road on Dublin’s southside and is part of the wider St Vincent’s Hospital site. It’s planned that the new National Maternity Hospital will be built beside St Vincent’s and the Sisters of Charity will own it as it is providing the land. The State is funding the construction of the €300 million hospital and the proposed deal has sparked objections to the role of the religious order in its future operation. Speaking today on RTÉ’s The Week in Politics, McDonald said it is her own view that the order should hand over the site. “I don’t think it’s a done deal. I think the whole discourse, the positioning of the different parties over the last week reflects the fact that this is still a situation in motion. The State needs to acquire the site,” she said. I also happen to think that the sisters, out of a sense of commitment to the public and out of a sense of understanding of their own history and the bad relationship that they had with so many women and so many mothers and their babies, that they might actually do the right thing. I think they should gift the site, personally. But if that doesn’t happen I think the State needs to acquire it by any means including CPO. The Labour Party are among the other political groups who have said that a compulsory purchase order should be considered in the case of the hospital site. Speaking on the same programme, Fine Gael Minister for Foreign Affairs Charlie Flanagan acknowledged that there is an issue with the ownership of the hospital and that this needs to be resolved. He said Health Minister Simon Harris has asked for four weeks to examine a number of options and that he is confident this will be successful. “I think there are a number of options, I’m not sure a CPO is one of them. I’m not sure if it’s possible in the circumstances. But I am confident that the minister, Simon Harris, and the government will deal with this issue in a way that is satisfactory,” he said. Pushed on his own opinion about the ownership of the hospital, the minister said that his personal views are not important. I didn’t come to politics to impress my public views on people, but from a government perspective I acknowledge that there is public concern here and that concern needs to be met. And that public concern will be met. “There are a number of options here that I’m sure will be looked at and I’m encouraged by the comments of Mr Kieran Mulvey, the mediator, and he said that there are conveyancing options, one of which would be a long-term lease,” Flanagan added. Fianna Fáil TD Stephen Donnelly also gave his view on the issue, saying that all the details of the site’s ownership need to be looked at. He made reference to concerns that the lands may have been used by the St Vincent’s Healthcare Group as collateral for bank loans, potentially complicating any transfer of ownership. “If we can’t CPO it or buy it, or if indeed the sisters can’t sell it because maybe there have been questions raised about maybe there is a lien, that the banks have lien on it and legally it’s not possible. What are those complications? What are those obligations?,” Donnelly asked. Donnelly also said that, aside from legal technicalities, the Sisters of Charity should be asked whether they would be happy to sell the land. Email “Mary Lou McDonald says the State needs to get maternity hospital site 'by any means'”. Feedback on “Mary Lou McDonald says the State needs to get maternity hospital site 'by any means'”.